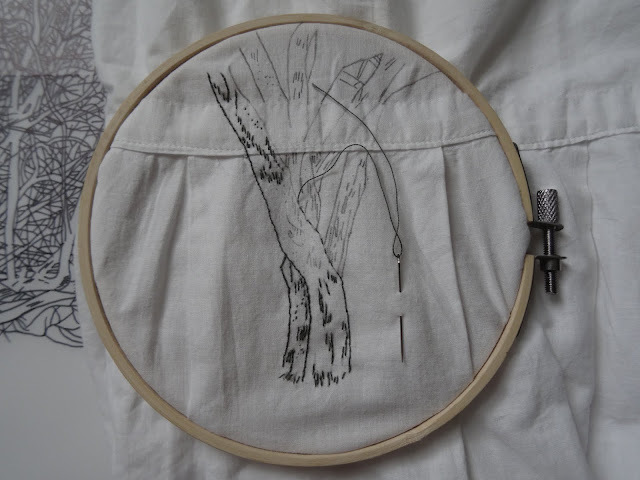 It was very pleasant two evenings ago to pick up my fine needle and make a start with embroidering my hawthorn tree image onto a girls handmade nightgown. After a long search for the right dress I purchased the nightgown in a vintage shop in Cromford, Derbyshire this February. Resting on its small wooden hanger, haunting my living room, the dress called to me begin, begin... It had to be patient and wait but, finally, tiny grey stitches pierced their way through warp and weft. Picking up my needle brings me closer to myself, it makes sense, it brings me home. This hawthorn tree is near my childhood home, I'd photographed it recently and created the tracing, musing upon my childhood, the forest, the lack, the wonder, the meaning behind taking needle to cloth for this solitary tree and the solitary girl.